Potting Sheds, Offers & Deals, Who has the Best in UK Right Now? Potting sheds are a must have garden building for all those with green fingers. They provide a warm environment, secure from damp, cold and rain, that encourages the growth of plants and seedlings, and traditional models with angled glazed frontages can be particularly good at giving plants the light and heat they thrive upon. To many people, a timber potting shed is also a much more attractive and desirable building than a greenhouse, and they can also be tougher and more resilient. If you’re thinking about potting sheds at the moment, take a look at our handy WhatShed guide to the ten best potting sheds available in the UK online right now. What makes a perfect potting shed? We firstly considered the price, and the value for money compared to its size. We also looked at the quality of components used, and their durability, and also at the design and look of the shed as a whole. In this way, we found ten models that were worthy of being in our league table of the very best potting sheds that can be found online in the UK today. Although the number of potting sheds available is lower than many of the categories of garden buildings we review, we still found ten of exceptional quality. Choosing the very best wasn’t easy from such a competitive classification, so it’s congratulations to the Rowlinson Shiplap Potting Shed. It takes top spot by being two great garden buildings in one, a storage and a potting shed, and also coming at a very reasonable price and with a ten year warranty period. 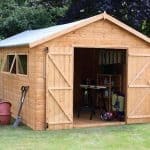 Whether you’re looking for the perfect potting sheds or great greenhouses, WhatShed bring you independent and in depth reviews that have the answers to all your questions. Potting sheds are among the most practical of all garden buildings, but that doesn’t mean that they all have to look the same, or that they can’t be very attractive as well. This deluxe potting shed from Rowlinson is proof of this, as it caught our eye from the moment we saw it. In effect it’s a combination of a potting area and a secure garden shed, and it captures the best of both of those elements. Considering its size and high quality components it also represents good value, and it’s one of only two potting sheds in our top ten list to feature an extended warranty. With so much to recommend it, we have no hesitation in putting this at the very top of our league table. 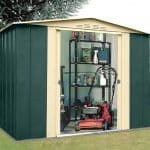 The single doorway leads into the shed section which takes up half of the building, and there’s more than enough room for a lawnmower and a good selection of tools and equipment. The latter half forms the potting area, with five closed windows, five opening windows for ventilation, and five sloping windows so typical of potting sheds. We were impressed by the 10 year warranty as well, as not only does it give added value and added peace of mind, it shows how effective and reliable the tongue and groove cladding is. Most of the potting sheds we review follow the traditional design that gardeners have been using to their advantage for decades: a rectangular timber frame with a sloping glass front that’s designed to make the most of the sun’s rays. This retains the glazed frontage but in this case allies it to a pent shed design, meaning that it’s the roof that slopes whilst the glazing is placed vertically. Whilst gardeners may debate which system produces the best results, we found it very striking. It also means that there’s a real expanse of glazing, and there’s also more room within the shed than we usually see. 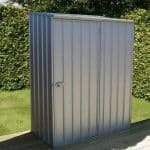 The base dimensions are 3.05 x 1.83 making this an ideal utility shed as well as just a potting shed. We were pleased to see a potting bench included as standard, ideally positioned adjacent to the windows, and both the windows and stable style door can be opened to create the perfect temperatures for your plants. 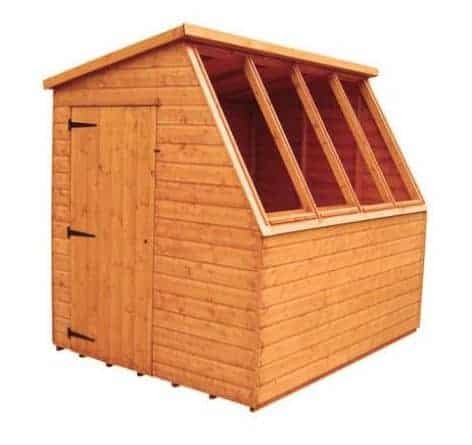 For such a sizeable shed we were surprised at just how little it cost, and with its good looks as well this was a worthy runner up in our league table of the very best potting sheds that are available to be bought online in the UK today. We’ve reviewed lots of Strongman garden buildings, and as their name suggests they place an emphasis on tough and durable components. We were pleased to find that they had carried this ethos on to their potting sheds as well, and we found that this looked and acted strong. By this, we mean that the first thing that caught our eye were the four angled panels of glazing, which were proportionately larger than we usually see, and that can therefore can capture more of the sun’s rays that plants thrive upon. We were also impressed by the strong frame, measuring 44 x 27mm, upon which the shiplap cladding is mounted. This is thicker than average, and means that this felt stable and secure once assembled. 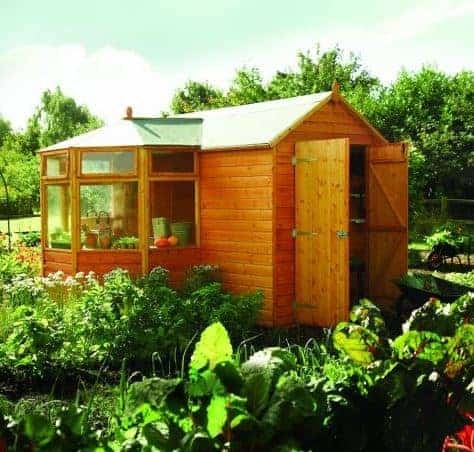 This could prove especially important for those who would like the benefits that potting sheds bring, but who are worried that their garden is often exposed to strong winds. Another feature that we really appreciated was the inclusion of secure key operated lock as standard. This is something we always welcome, but something that we rarely see in potting sheds. 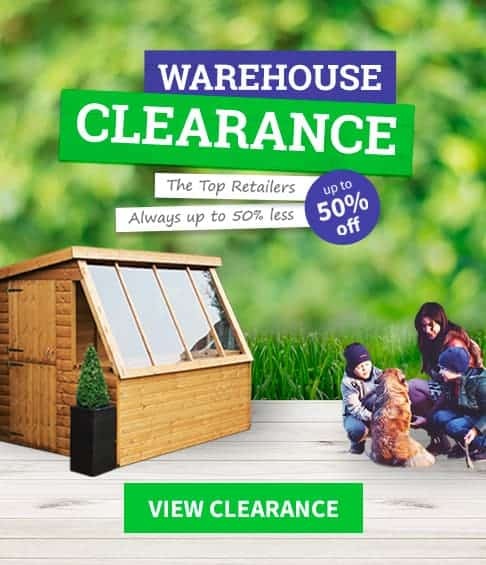 It means that the owner can keep not only their plants inside, but also valuable items of gardening equipment, and this useful addition helps to carry this into our top three especially as it comes at a very affordable price. This is the second from the Rowlinson range of deluxe potting sheds to make it into the top half of our league table, and once again it takes a radical approach to the genre by combining it with a traditional wooden shed to great effect. On this occasion, from one side this looks like a standard, if attractively constructed, garden building with an apex roof to carry rainwater away; it’s only when you look at the other side that you see the potting shed extending from and occupying one corner. Not only is this incredibly practical, meaning that the customer gets two garden buildings for the price of one, it also creates a look of its very own, and this could become a talked about and loved garden feature. As the structure as a whole is considerably larger than most potting sheds we see, there’s still a generous amount of room to grow plants in the potting corner element of it. There are three opening and seven fixed windows in this section, and being made of styrene they’re tough and shatter proof. 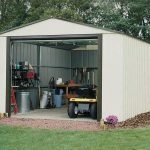 The 10 year warranty is an indicator of how tough the shed as a whole is, and it’s only the price that may be beyond the budget of some that prevents it from achieving an even higher position. This is one of the most traditional looking potting sheds that we’ve seen, with a bank of glazing ready to make the most of the sun. There’s nothing wrong with that of course, as we know that this traditional styling will appear to many gardeners, and we ourselves found it good looking from the moment we saw it. What earns it such a high position within our WhatShed league table, however, is that it represents very good value for money. It’s the second cheapest shed to make it into our top ten, and yet with a base area of 2.43 x 2.83m it’s far from the smallest. An indicator of the high quality of components used by the manufacture is the use of horticultural glass rather than the more cost effective styrene. This does mean, however, that the owner will have to be careful not to break any of the four large angled panes, even though they are still tougher than standard glass. The tongue and groove cladding has a strong frame behind it, and we were also pleased to see that the single hinged door can be securely locked with a key. 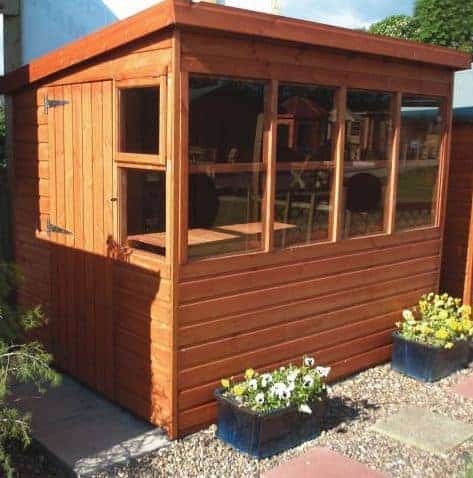 If you’re looking for secure potting sheds at a lower than average price, this is a model that should be added to your shortlist. Whether we’re reviewing potting sheds or plastic workshops, we always like buildings that provide extra features and added value, which is why we liked this model so much. Once again it has a large section that can be used as a garden storage facility alongside the potting area, but this time the potting shed follows the classic design with angled glazing leading up from a tongue and groove clad lower section. For this reason, we feel it’s sure to appeal to those who want the versatility that the extra storage space provides, but who also believe that the traditional angled front potting sheds provide the optimal growing conditions. One thing that became evident as we reviewed this shed is that it’s heavy duty, with thicker than average tongue and groove cladding, and in fact this turned out to be the case with 18mm cladding used rather than the 12mm that we frequently see. This makes for a strong and reliable building, even though like all but two of the potting sheds in our top ten list it doesn’t feature an extended warranty beyond the statutory one year provision. 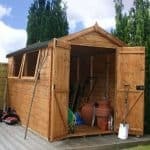 It also costs significantly more than some potting sheds of a similar size, and this has been taken into account when determining its final position. 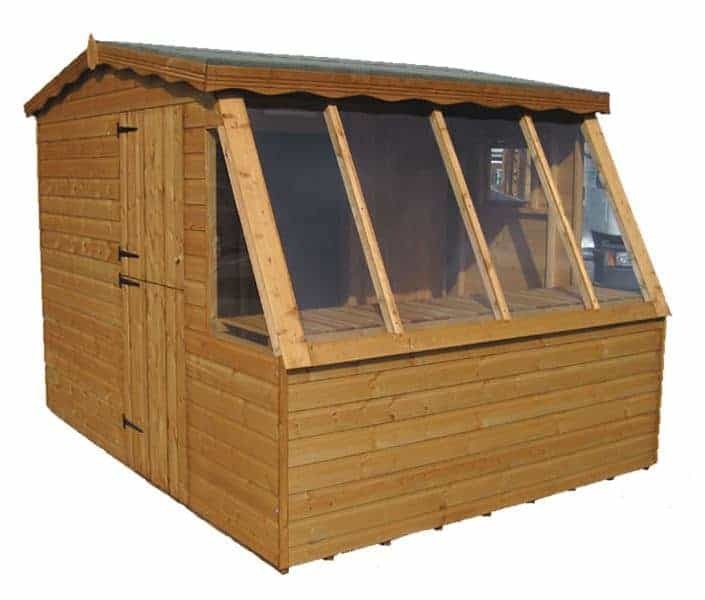 We have here another high quality potting shed that offers a base area of ten feet by eight feet. 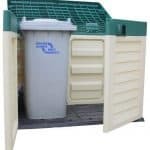 This provides a large area to grow plants in as well as enough room to store gardening utensils such as dibbers, and items such as pots, soil, and compost. 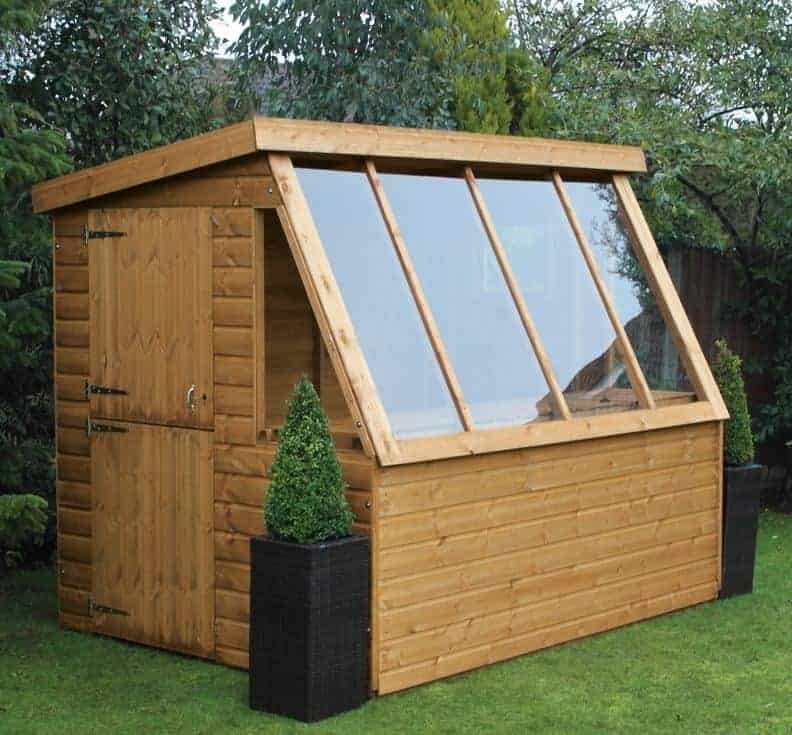 With a ridge height of 2.04m and an eaves height of 1.83m, the equivalent of six foot, there’s more headroom than we often find on the potting sheds we review, and this is ideal for the keen gardener as it means that it’s a pleasant and comfortable environment to spend time in. This comfort is enhanced by the ventilation that can be provided by opening the large window, or by opening the upper half of the stable doors. It’s a simple and effective way to control the temperature, and yet it’s not something that we always see on the potting sheds we review. 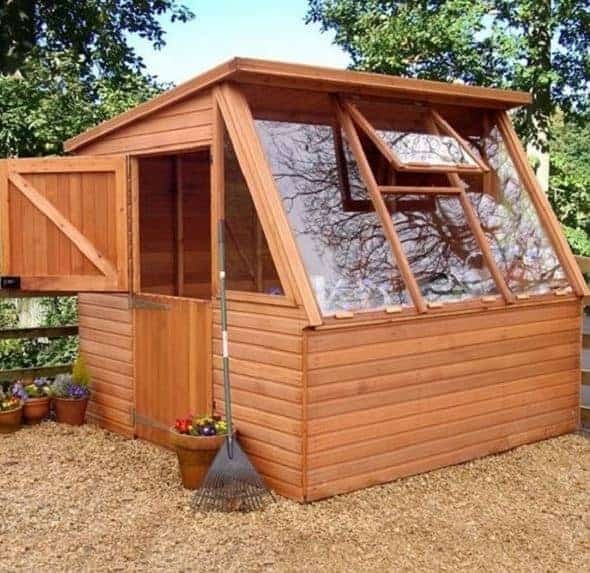 The tongue and groove cladding used has a standard thickness of 12mm, which accounts for the lower positioning of this shed compared to the shed above it which has similar dimensions, but on the plus side it is a little more affordable at a price of under thirteen hundred pounds for what is a well designed and well constructed potting shed. Although this bears the word ‘greenhouse’ in its name, it’s very much a traditional potting shed, and it’s a good example of the advantages they hold over classic glasshouses. There’s a lot less glazing, so they are less likely to get damaged or broken, and yet the positioning of the glass gets the maximum benefit out of any sunlight. With a lot more timber on show as well they are in many people’s eyes much more attractive garden buildings, and we were certainly impressed by the design and styling of this building. The square base size of 1.83 x 1.83m is among the smallest of any of the potting sheds we’ve reviewed, and yet we were pleased to find that this is partly compensated for by the taller than average pent roof. It has a peak height of 2.29m and even the height at the back, its lowest point, of 1.98m is significantly more than the ridge height on many of the sheds we see. It means that the glazed panels are longer than we often come across, bringing added benefits for your plants. We were also impressed at the inclusion of toughened glass throughout, although the higher than average price tag has prevented this high quality potting shed from achieving a position in the top half of our league table. At eight foot by eight foot, these potting sheds have more than enough space to grow seedlings, flowers, tomatoes or any other plant that needs to get a good supply of sunlight and heat for as much of the year as possible. It isn’t, however, so large that it becomes obtrusive, so we feel this is a good choice for those who love the idea of having a potting shed and yet don’t have too much space available in their garden. This is the second model in our league table to have vertical rather than sloping glazing, and yet with smaller windows at the sides as well, including two opening windows, a good supply of natural light will still reach the integral potting benches below. What made this stand out from the other potting sheds we’ve reviewed is that it’s very tough. The 22mm tongue and groove cladding is almost twice as thick as that which we are used to seeing, and it fits tightly together to ensure that rainwater is kept out. 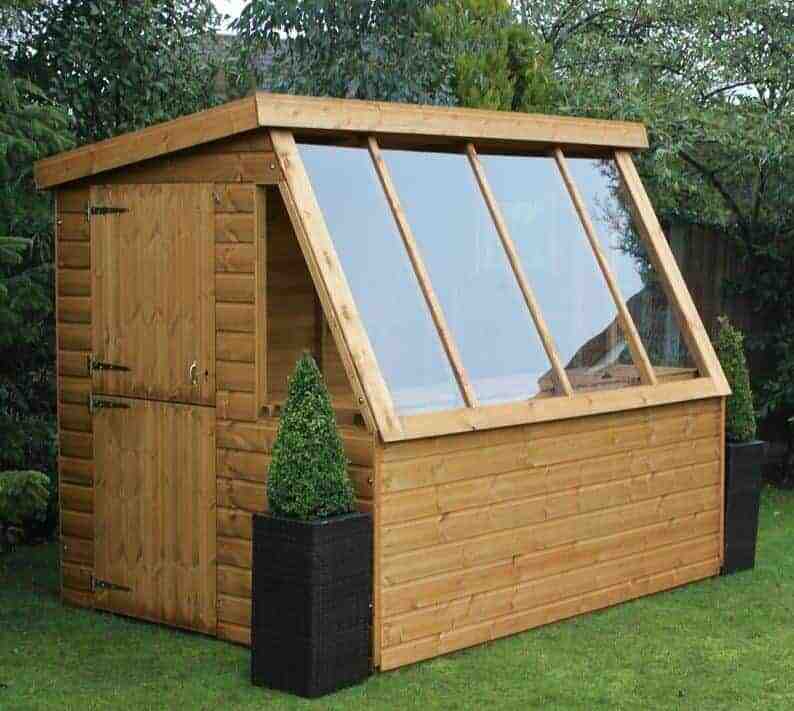 This function is also helped by the pitch of the apex roof, so it should prove to be a very durable and reliable shed even though there it once again only features a one year warranty period rather than the ten years or more we would have liked to see. 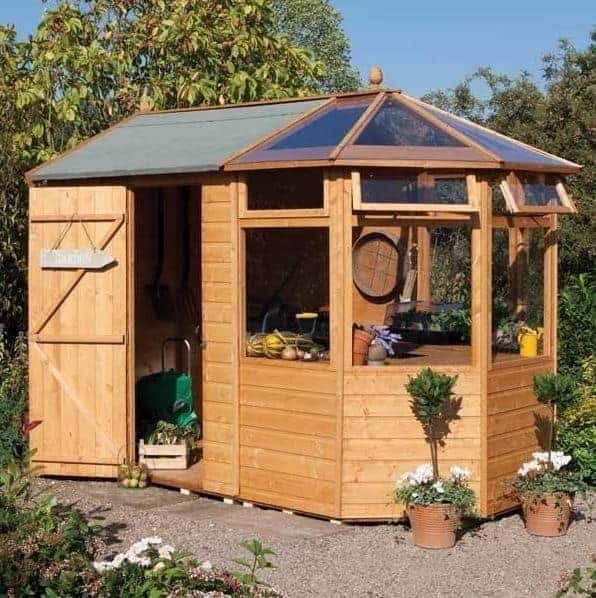 This is the second of the Malvern Solar model to make our list of the ten very best potting sheds that can be bought over the internet in the UK today, but this is a slightly larger model and so will have more appeal for those who have larger gardens, or even those who grow plants and seedlings as part of a small scale commercial operation. It occupies the final spot in our table, and yet we found it to be a very high quality building; it’s only the price point of nearly two thousand pounds that prevents it from claiming a much higher position. If this falls within your budget, therefore, you may want to consider it as one of your first choices. What makes this stand out from many of the other potting sheds that we’ve reviewed is that it’s very tough, and we were pleased to see high calibre components used throughout the building. Examples of this are the toughened glass which is very hard to shatter, and the framing which at 44 x 44mm is thicker than that provided by any other manufacturer. We also liked the inclusion of staging across the width of this potting shed, saving the owner time and money that would have been spent on adding shelves and benches.